So spring has rolled around and you’re thinking of starting a new lawn. Perhaps you had a particularly rough winter, and your grass didn’t make it through the harsh weather. Or maybe you had a particularly bad time fertilizing your turf, and it got burnt beyond repair. Whatever the reasons might be, starting a new lawn can be a really challenging endeavor if you don’t know what you are doing. At first glance, it might seem that sowing grass is as easy as throwing the seeds into the soil and letting them grow. In some cases, you might even get decent results doing just that. However, despite grass growing practically everywhere, getting your turf to grow just like you want it to is the real challenge. After all, if you’re going to invest in a new front lawn, why not take a few extra steps and do it the right way? In the past, most gardeners had to put in a lot of effort and working and keeping an eye out to create the perfect garden. Nowadays there’s a tool and a product for just about anything. Mind you, this doesn’t make lawn work mindless and automatic; there’s still a good amount of knowledge and challenge required to create a beautiful lawn. Fortunately, advances in landscaping and gardening technology have significantly simplified much of the process, allowing virtually everyone to create a lush and green front lawn. Jonathan Green is a company dedicated to creating the best products specifically for turf growing. While other companies trade in all-purpose fertilizers, this organization is wholly dedicated to creating products to grow that lush green lawn you’ve always wanted. This product comes with high amounts of phosphorus, which promotes deeper root growth, improving the grass’ ability to absorb nutrients from the soil. This product is also enriched with iron to stimulate deep greening in every single blade of grass. In short, this fertilizer could be a bit more expensive than the competition, but its quality is second to none. Scotts is a brand of the Scotts Miracle-Gro Company, which is the biggest manufacturer of lawn and garden products in North America, with a significant presence in many countries such as the United States, Canada, and most of Europe and the Asia Pacific region. 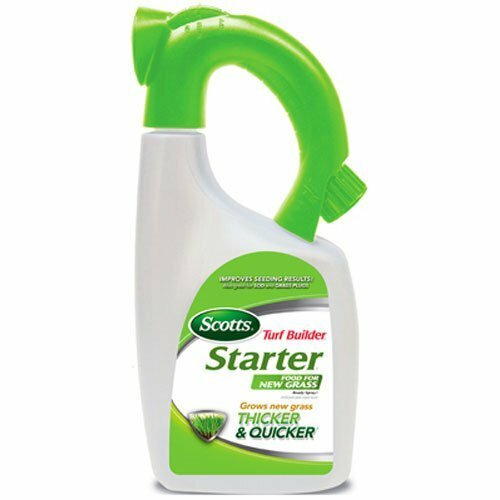 You will see Scotts’ products in most hardware stores and retailers, and with good reason; this company produces some of the greatest fertilizers and tools in the market. You really can’t go wrong with this brand. 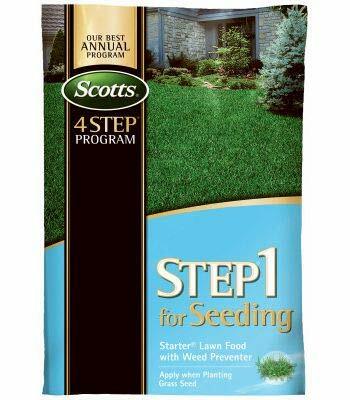 This product, in particular, is part of Scotts’ “4 Step Program to Achieve a Beautiful Lawn.” Step 1 is meant to be used as the first fertilizing of the year, to strengthen the grass that was weakened from the harsh winter. Additionally, this fertilizer includes a weed preventer, which can stop the growth of crabgrass, barnyard, and foxtail. The Espoma Company has been in the lawn and garden business for more than 8 decades. They put all their experience and love for the trade behind each of their products. Their goal in this market is two-fold; on one hand, they strive to provide the best lawn care tools and products. On the other hand, they work to uphold the values which have made them into the respected company they currently are: quality, service, integrity, education, and responsibility. 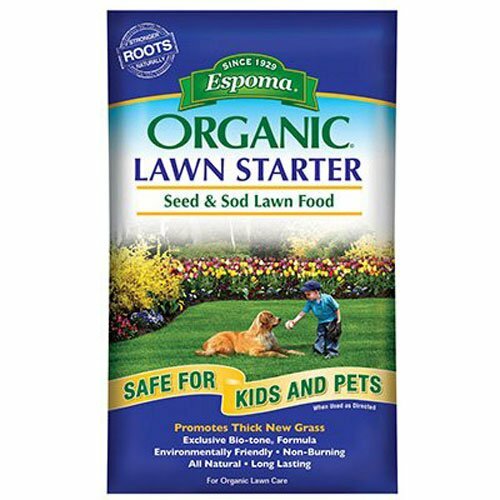 This grass starter contains all the necessary nutrients to promote the growth of your turf. Similar to our first entry, it also contains high amounts of phosphorus, to promote deep root growth and create a stronger patch of grass. The main difference this product has, in comparison to others, is that it is completely organic and contains no chemical additives. This means that it is perfectly safe for your kids and pets to run around on. Pacific Sod is California’s first and finest sod company. Created as a family-run agricultural company in southern California, this group of committed individuals have been in business since 1886. During all these years, they have dedicated their trade to creating the very best products for turf growing. 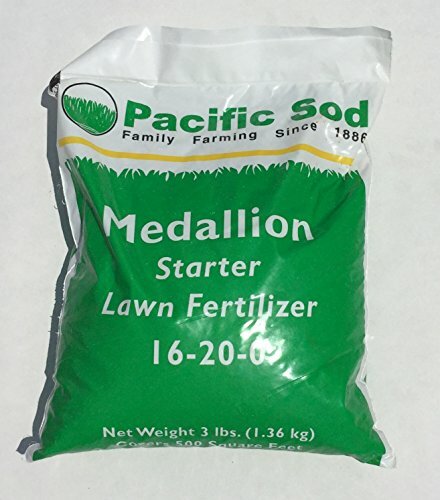 Their Medallion Starter Fertilizer is designed with a generous ratio of 16% nitrogen and 20% phosphorus per pound of product. This ensures that your grass is supplied with the necessary nutrients to promote the growth of both its roots and leaves. By using this product, your grass may grow up to 30% faster, compared to unfed turf. While this fertilizer doesn’t offer a potassium supplement, it is enriched with 13% sulfur, which is an important element as it is necessary for your grass to help produce the proteins it needs to grow. GS Plant Foods is a family-run business owned by Francis, and his wife Tina. Francis’ love for growing orchids is what led him to create this company. After a period where he couldn’t get his orchids to bloom, Francis was informed of a homemade recipe for orchid fertilizer. After witnessing fantastic results, he went on to perfect the formula, adding several components that he thought were missing. After sharing the product with his friends and family, he noticed they too were also seeing great results with his new products, and thus GS Plant Foods was born. 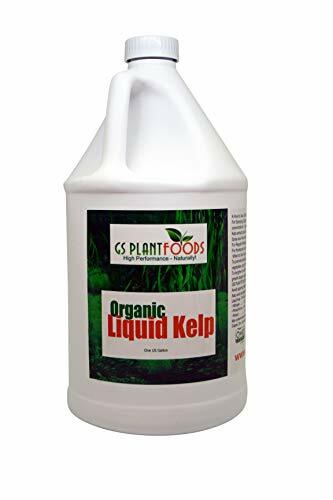 This product, in particular, is part of their top-of-the-line kelp fertilizers, which are made from the finest seaweeds. Their specially designed formula will improve seed germination and increase root development from the very first use. As it is made from 100% natural ingredients, this product is perfect for organic lawn and is perfectly safe for kids and pets. With the quality behind each of Scotts’ products, it’s no wonder that they would get at least more than one entry in this article. This product, in particular, is a great alternative for our very first entry. If you own a small garden and don’t have much need for a weed preventer, then you might be better off using this grass starter. This 3-pound bag can fertilize up to 1,000 square feet when properly applied. 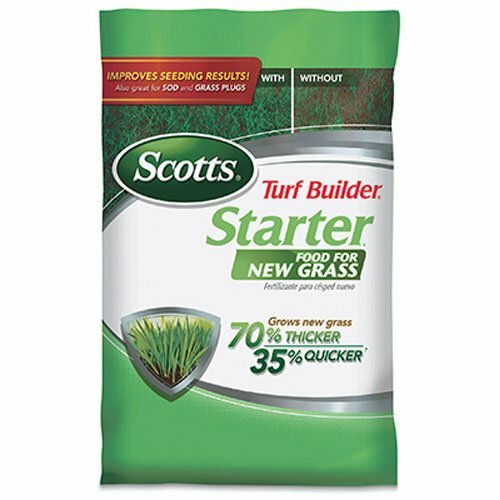 The third and final entry from Scotts in this list (we promise) is this very easy to use turf builder. 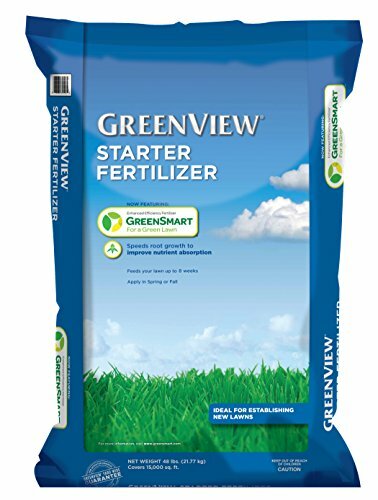 Enriched with all the necessary nutrients your grass needs to grow, this starter fertilizer will definitely be your go-to choice for when you need to feed your grass in a pinch. Using it is as easy as hooking up the container to your hose and watering your grass like you normally would. This fertilizer is the stuff golf courses are made of. If you have ever seen a golf match on TV, or visited a country club yourself, and wonder what they feed that turf with, then look no further. If you have always wanted your grass to look as beautiful and uniform as the one in professional golf courses, then this is the product for you. Grass, like all plants and vegetables, needs certain required supplements to grow strong and healthy. The main three macronutrients or the big three, as many gardeners call them, are nitrogen, phosphorus, and potassium. These three are single-handedly the most important components that any plant will need to grow. Nitrogen is important because it is the basis of all plant tissue and DNA. Without nitrogen, a plant would not be able to grow; it would wither and die. Phosphorus is also important, as it plays a major role in photosynthesis and energy transfer within the plant. Last but not least, potassium is used by the plant in many major processes, such as sugar movement, cell division, water retention and root development, to name a few. That’s it for the three major macronutrients. However, there also exists a group of smaller, yet equally important micronutrients that are not necessarily mandatory; however, your plants will definitely benefit from their presence. These nutrients are calcium, magnesium, sulfur, manganese, copper, and boron, among trace others. All of these elements play important roles in prolonging and improving the life of a plant, promoting green leaves, preventing blossom-end rotting, and so on. Most, if not all fertilizers include the three macronutrients in their formula. Many are also supplemented with some of the aforementioned micronutrients. For the specifics of each product, be sure to thoroughly check the back label, so you can see exactly what’s going into your lawn soil. You will find instructions for exactly when and how to fertilize your new grass on the label as well. Now that we know what our lawn needs to properly grow; how do we go about choosing the right fertilizer for the job? There are hundreds of options available on the market, so how do we know which one is best? Below you will find our top picks of best fertilizers for growing new grass. When it comes to starter fertilization, knowing which product to use is half the battle. Knowing how to actually spread it effectively is the other half. To determine which fertilizer is appropriate for your lawn, the best thing you can do is to run a test of your soil, to see which macronutrients it naturally possesses. With the use of a soil test kit, which you can grab at any hardware store or on Amazon, finding out your soil’s nutritional properties is very easy. With your soil’s nutritional values in hand, all that’s left is to pick a fertilizer that complements the weaknesses present in your turf. For grass, you would need more nitrogen and phosphorus, and less potassium, so you would be better off picking a fertilizer with more of these two elements. With your bag of starter fertilizer in hand, all that’s left is to spread it. The method of application can vary according to the type of product; some might be liquid, while others can be powders. However, most grass fertilizers come in granular presentations. Spreading it can be as easy as throwing handfuls of product on the soil, but this is not cost-efficient nor is it particularly effective. For granular fertilizers, you might want to purchase a broadcast spreader that will allow you to apply the product in a uniform and effective manner. A popular method of spreading starter fertilizer -and any fertilizer in general- is by first running the spreader along the edges of your lawn. The Scotts Turf Builder broadcast spreader is equipped with EdgeGuard technology, which can spread your product efficiently along the edges of the area, without spilling onto the sidewalk or driveway. 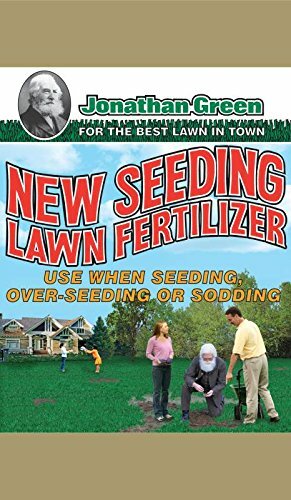 After you have fertilized your edges, you will want to spread the product through the remaining area by running your spreader in rows, with about 5 feet of distance between each row until you have covered the whole lawn. To ensure that your lawn is properly fertilized, try walking at a steady speed of around 3.5 miles per hour, which is approximately the pace of a fast walk. If you walk too slow, the width of your spread will be reduced and you will have to work two or three times as hard to cover the whole lawn. Walking at the recommended speed ensures that your product is evenly spread across all the rows, and your garden will be that much greener because of it. Starting a new lawn or patching up the damage from a nasty winter can be really challenging work, but does it really have to be that way? With the ongoing development in fertilizing and gardening technology, creating the lawn of your dreams can become a reality. Like many things in life, when it comes to growing plants, you’re only as skilled as your tools allow you to be. In that sense, be sure to always pick the appropriate equipment for the task. For turf growing, choose the fertilizer that complements your soil’s shortcomings, and use a good spreader to distribute the product evenly across your lawn. Last but not least, always, and I mean always, read the labels of the products you are using. Some fertilizers will actually damage your plants if you use too much. Similarly, some spreaders or other tools may be equipped with accessories that you wouldn’t even know about if you don’t read the instruction manual.